Ensure that you are dealing with a qualified integrator with experience, expertise and certification for the required solution. Ensure that all electric strike hardware will meet the requirements as outlined in the building code. Fire rated doors require fire rated electric strikes. Matching the proper electric strike to the door frame and door hardware is critical for proper operation. Electromagnetic (mag) locks require special consideration when being installed. Permits, proper signage; fire alarm integration; power source; reset/override control; testing and inspections are some of the considerations. Openings with automatic (handicapped) door operators may require timer modules to ensure proper integration with access control systems. This will help ensure the operator motor functions as intended. Consider the wiring requirements when selecting door hardware. For example, double doors may require hinge-transfer hardware or metallic door loops to properly support these solutions. There are a variety of trim treatments designed to help conceal wiring. Stairwell exit doors require positive latching, even on designated crossover floors. Request to exit sensors or buttons should be installed such that they can’t be inadvertently triggered. Programing of doors to release on activation of these sensors should be investigated before implementing this option. Wireless lock solutions are quickly becoming a cost effective alternative to standard electric lock hardware. Many of these locks use internal clutch mechanisms to ensure secure function for many openings. 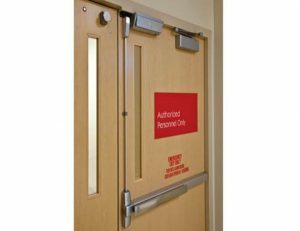 There are also time-delayed locking solutions for exit doors designed specifically to help secure critical exit doors. Some openings may best be secured with high security portals like turnstiles with anti-tailgating technology. Always choose the right solution for your requirements. These tips may help you manage your access control requirements. Adherence to local building code requirements will ensure you have a safe and secure system. Remember, local Authority having Jurisdiction (AHJ) requirements may be specific to your region or facility. FCi would be pleased to help with your access control system design and deployment. We have the experience, expertise and technical resources to help with any project.